Our Stock Take module can help you go through and verify your actual stock on hand matches the on hand value shown in the Inventory tab. It will also allow you to update the on hand value in the system to match your inventory count when discrepancies are found. To access the Stock Take module, head to Admin > Stock Take. First you probably want to setup a "Stock Take List" of items to be checked. This can be a random sampling of your inventory, the whole inventory, or a subset based on category or high frequency sales. Now that you've told it what products you want to check, you can go do a stock take. Click "New Stock Take" there to begin checking stock. 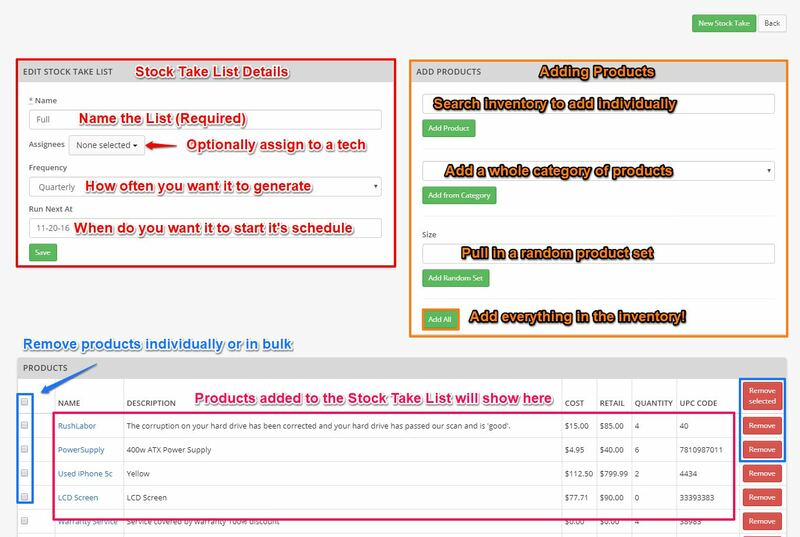 You can do this from the Stock Take List overview or from with the Stock Take List edit screen. After starting a new stock take, you will be taken to the stock take main screen. From here, we have a few different ways to enter your stock in an attempt to make it as fast as possible for you. The fastest mode is barcode scanning. You can get a barcode scanner (USB or Bluetooth/mobile) and just scan every product you want to count. The site will make success/fail sounds so you can concentrate on what you are scanning. If you scan some items that aren't able to be found, they'll show up in the top list of "Recent Scans" - but not in the entries for batch area. You can type quantities and hit enter for speed. If on an iPad/tablet, you could also use the onscreen keypad. (1-9, since it auto-submits - no 0). When ready to move to the next item click "change". Note that your progress is saved as you go, so you can always navigate to a different page and then return to this stock take to continue entering data. Once you have completed your inventory count and want to finalize the results, click the Finalize button at the top of the page. This will take you to the Resolve Stock Take step in the process. Expected Quantity: this is the current on hand quantity for each item in the Inventory tab. Counted Quantity: this is the value entered during your inventory count. Update to Counted: this is a series of checkboxes for each item in the stock take. Any items that have this box checked will update the on hand value in the system to the value seen in the Actual Quantity of the stock take once the stock take is submitted. After reviewing the information and selecting the items to update, click Submit to finalize the stock take. This will set that particular stock take to a "read only" state so that it can be reviewed, but not revised.